Do you think this is what Jesus meant? This is what we should feed the hungry? I think so. Why not? No…don’t answer that. Just think about what Jesus said. Feed the hungry. He didn’t add any caveats that it must only be soup or sandwiches. He didn’t say only if they were deserving. He didn’t say only once and then they are on their own. He said: “Feed the hungry”. That’s it. If I had the money, I would treat the hungry to dinner at that restaurant. I think they would enjoy the bisque, the lamb or the tuna. Actually I have had that particular bisque. We had a soup tasting contest at my church last winter and the chef from that place brought that bisque. It is delicious!!! One final thought, my goal in life is to feed people. If I had the means, I would provide free meals every day. For no other reason than Jesus said to feed the hungry. I think we are lacking common consideration in this country. Just having the thought to think about what you are doing and how it impacts other people. A month ago, I went to get my infusion at the hospital. My doctor has put me on Orencia for my arthritis and it is helping tremendously. My inflammation levels have gone down, my joints are less swollen and I am feeling better. By the way, arthritis is not just about having swollen joints or having pain in the joints. Arthritis makes your whole body feel bad. Run down, tired all the time, just generally fatigued. What the Orencia does (and other medications I am on) is to suppress the immune system so that my immune system won’t attack my joints which is what causes rheumatoid arthritis. Anyway, I went for my infusion (IV) at the hospital last month and after that I went to work. I saw one of the assistant managers walking around the store and she looked down. I asked her if she was ok and she said, standing not a foot and a half from me “I don’t feel good. I have a cold”. Well, thank you! Now I have it! And I did. Three days later I came down with that cold. Had to go to the doctor immediately because with my suppressed immune system, a cold should develop into pneumonia and I could end up in the hospital or dead. Just because my assistant manager didn’t want to stay home with her cold. If we had basic consideration, people would realize that when they are sick, they shouldn’t spread their germs around. There are many people with compromised immune systems, such as myself, who can’t be exposed to germs. One thing I noticed on Downton Abbey, which takes place in the early 20th century, is that when someone doesn’t feel well, they go right to bed. They don’t expose others to their germs. They don’t try to be strong and not give in to a cold. They give their body what is needed, which is rest, and don’t expose others to their germs. Why am I writing about this a month later? Well, I went for my infusion again today. I get it once a month. After the IV finished running, the nurse came over to take it out. She was a different nurse than the one who had started the IV and I hadn’t had this particular nurse before. As she came over, she opened up the band-aid to put on hand and I noticed she was holding the open band-aid with her thumb on the bandage part of the band-aid! Her thumb that was not wearing a glove! THEN she took said band-aid, put it on my leg along with the gauze she was going to use on top of the open vein. ON MY JEANS!! She had no idea where my jeans had been. She had no idea if I had a dog or cat that had been crawling on them. And I had no idea where her thumb had been so I have no idea what kind of germs she had deposited on my band-aid. So she put a contaminated gauze pad and band-aid on my open vein when I had just had medicine pumped into me to suppress my immune system!! See??? No consideration! As I am writing this, I am getting more and more upset by the idea that, once again, I may have been exposed to germs right after my Orencia infusion. So I just called the OR manager at the hospital and told her what happened. I was very nice about it but I want to make sure it doesn’t happen again. She assured me she would follow up with the nurse who did it and would come see me next month when I am in for my infusion. She, the manager, also said to let her know if I developed any infections or problems because of this. And I will. I feel better having called her but I really wish people would just practice a little common consideration. Look out for how their behavior affects other people. No one lives in a bubble in this world and how people act impacts everyone around them. PS I did change the band-aid as soon as I could and wiped the area with an alcohol wipe to clean it off. Just wanted to mention that. – I was leaving the Irving station in Kennebunk this afternoon and I looked over and saw a small fire. Mostly smoke but there was flame. I went back into the Irving and told them and some guy came out with a bucket of water and put it out. People should really not throw their cigarettes out of windows. Especially on dry mulch outside a gas station! – A woman was hired to work at the store. She reeked of cigarette smoke and kept coughing. When I told her to please cover her mouth when she coughed, she replied that it was just a smoker’s cough. Well, in my opinion, that doesn’t matter because things still fly out and will land on the bread she is bagging. I know…gross! – The same woman has now quit. Why? She would lose her breath walking across the floor and putting product on the shelves. Because she smokes. Both my parents smoked. I grew up with it. I used to tolerate it. No more. Can’t stand the smell of it. Either by someone smoking in front of me or smelling it on their clothes. Yuk! Please stop smoking. And, if you can’t, please don’t cough around me, stand too close or throw your lit cigarettes on the dry ground. Especially outside of gas stations where there is GAS! When I was in college, there was a weekly lecture on Friday mornings open to the whole campus. It was called Forum. It was free and not required for any class. I attended many of them but, I’m sad to say, not all. I would look at the list of speakers and, if I thought the speaker and subject matter looked interesting, I would go. But sometimes…ok…most of the time…I opted to sleep in. On one such Friday, I didn’t recognize the name of the person speaking, the forum was about poetry and I really didn’t want to drag myself to campus to hear some poet. I slept in. When I finally did arrive on campus for an afternoon class, I stopped in at the student union to get something to drink and everyone was talking about the Forum speaker. I kept hearing how wonderful she was, how moving it had been, how inspiring, etc. I asked someone who the speaker had been and she said “Maya Angelou”. No, I didn’t. But I looked her up at the library (pre-Google days) and my heart sank. Regret. Deep regret. An opportunity to hear someone so profound and inspiring speak FOR FREE and I slept. Maya Angelou is an inspiration to me and also the source of one of my deepest regrets. She taught me and so many others great lessons in life. And one of the best lessons she taught me was to never miss an opportunity to learn. If I haven’t heard about someone or something, do research BEFOREHAND so I will know the best decision to make. Don’t decide to miss an opportunity based on ignorance or laziness. Rest in peace with God and the angels, Ms. Angelou! You lived a good life and will be missed. During my devotions today, I was reading “Intense Moments with the Savior: Learning to Feel” by Ken Gire. The reading I chose, appropriately enough, was the one on Gethsemane. Or, more precisely, Jesus praying in the Garden of Gethsemane. What Mr. Gire does in his writings is to bring to life with detail and modern references what Christ went through throughout his life. In the writing that I read today, he described what Jesus went through when he went to pray and while he prayed. He talked about the damp dewiness of the evening. Of the Roman sentry calling out the time as the disciples followed Jesus into the garden. He then described Jesus asking the three he chose – Peter, James and John – to wait and pray while he went off to be by himself. The angels watching Jesus were mention – watching and wanting to help God’s son but not being allowed. Then there is the description of Jesus. Not kneeling by a large rock with his hands gently folded. Not gazing up to the heavens with a look of contemplation. But Mr. Gire’s description is of Jesus, lying in the dirt, clutching at the soil and the plants, praying intensely to his Father. Throwing himself prostrate on the ground and pleading with God to remove this cup from him. The cup. That was what really came to life for me. The cup that Jesus bore for all of mankind. “And though it is a terrible cup, brimming with the wrath of God for the ferment of sin from centuries past and centuries yet to come…and though it is a cup he fears…he takes it”. This was why Jesus came. Why he had to suffer. Why he had to die. The sins of all mankind from before he was born until present day. Just in the past hundred years, think of the sins mankind has committed against God, our creator. I could go on and on and on. All of this just in recent memory. I haven’t even mentioned the Dark Ages, The Crusades, The Inquisition or any of the misguided and cruel things people have done in the name of religion and of the church. This is just a small portion of what was in this cup that Jesus was reaching for in the garden. That Jesus had begged that his Father would take from him. That Jesus sweated blood thinking about. What did Jesus say after all the pleading, praying and prostrating? “Yet not what I will, but what you will”. As Mr. Gire writes “Because more than he fears the cup, he loves the hand from which it comes”. Because Jesus loved, he was willing to take on the putrid festering evil that mankind had committed. More than the utter fear of taking on the sin of the world must have gripped his heart and filled him with agony, he loved his Father more and also he loved US more. He loved each of us…YOU…more. With a love that knows no bounds and is unfailing. Tomorrow…the true sorrow of Good Friday. Not only it is raining but it has been cloudy and raining since yesterday. To add insult to injury, it was also sleeting this morning. SLEETING!! It is March 31st! Tomorrow is April 1st. It is cold and cloudy and cold and cold and cold. The temperature has been stuck at frigid for so long I am having problems remember what warm feels like. Everyday is a day to bundle up in layers and walk with hands shoved in pockets and try to get from car to indoors as quickly as possible. 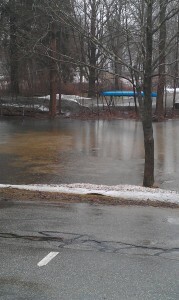 That is the backyard across the street from the church office. Last week kids were crunching through the snow playing some kind of game. Not it is a pond. 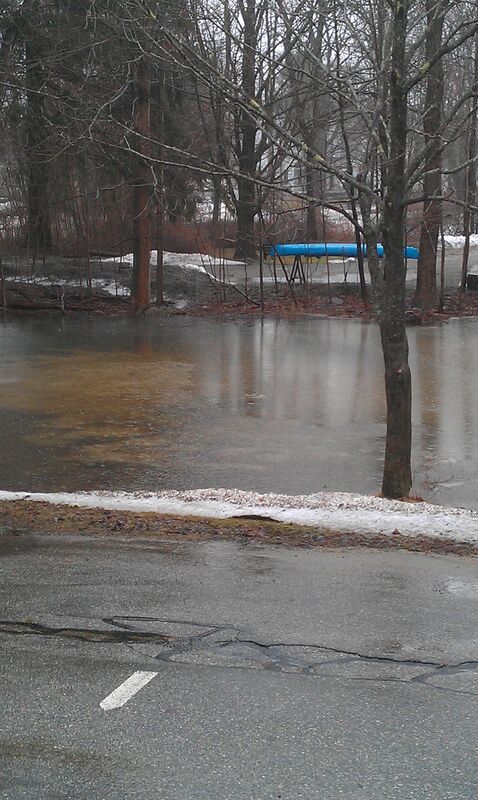 I am assuming the blue canoe in the background is for when the water gets so high cars won’t be able to get through it. At the rate it is going, that will be Wednesday. “Rainy days and Mondays always get me down”. When they are combined into one, it is a day to sing the blues. I have been thinking about this here blog recently. Not writing in it, mind you. Just thinking about it. I realize I haven’t posted since my birthday. There are a whole myriad of reasons why but it boils down to being too busy working and looking for work and not having much to say other than I am working and looking for work. That said, I was inspired the other day by my favorite blog, The Pioneer Woman (http://thepioneerwoman.com/). I was admiring how interesting her site is and how informative, organized and colorful. Her’s is a WordPress site, same as mine. Suddenly mine seems drab and not at all colorful. And it is titled “Thoughts Like Grapes”. One would think that a blog with grapes in it’s title would be more colorful. I think the reason I can’t make it more colorful is that I need to update it to a new version of Worpress. So I started to, it told me to back up my data, I contacted my brother to see if the data is backed up on his server, he said it was but don’t update the blog! Why? He is busy and can’t fix it if it all goes kablooey! Which, more than likely, it will. So here I sit. I finished the power points for Sunday, I am not working today so I am not completely wiped out and exhausted and I decided to just write something in this here blog. As soon as my brother is not busy, I am going to update this thing. I want to add categories and pictures and all kinds of fun stuff. Especially recipes. I have some good ones and I would love to share them. I just stood in front of a mirror at 2:07 pm and watched myself turn one year older. I didn’t look any different from one minute to the next so I think this aging thing is going just fine! So as I am one year old, I consider myself one year wiser, and one year more blessed. I am alive, healthy (disregarding arthritis – wish it would disregard me), have friends, family and a busy life. I would like other aspects of my life to be different but I trust that, in time, things will improve overall and I will climb out of the valley I have been slogging through the past few years. Life is a series of hills and valleys. I pray, as the years unfold, my valleys will get shallower and, thus, my hills easier to climb. On that note, to all of us who have birthdays on this day of LOVE, Happy Birthday!! May God bless you with abundant joy, grace and love! !